Due to a sustained growth of our business, we are opening a new position in our organization. 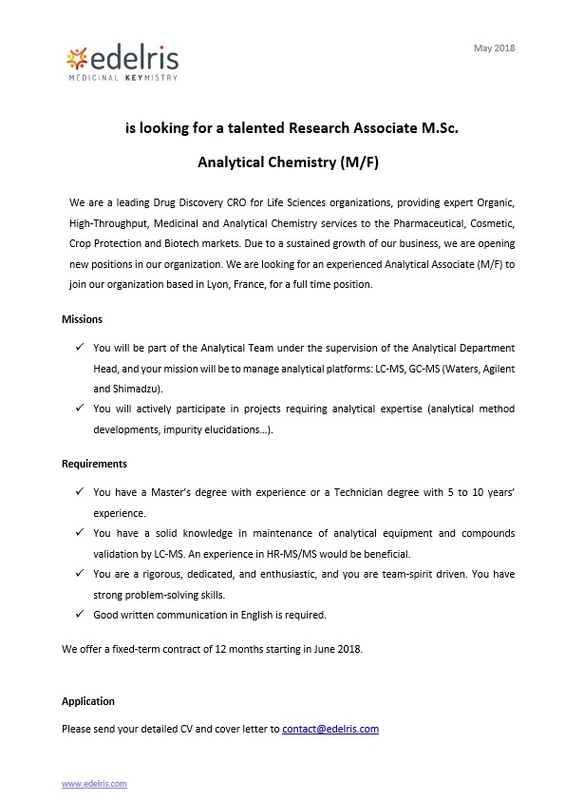 We are looking for a talented scientist PhD (M/F) to join our organization. Edelris is looking for a talented Research Associate B.Sc./M.Sc. 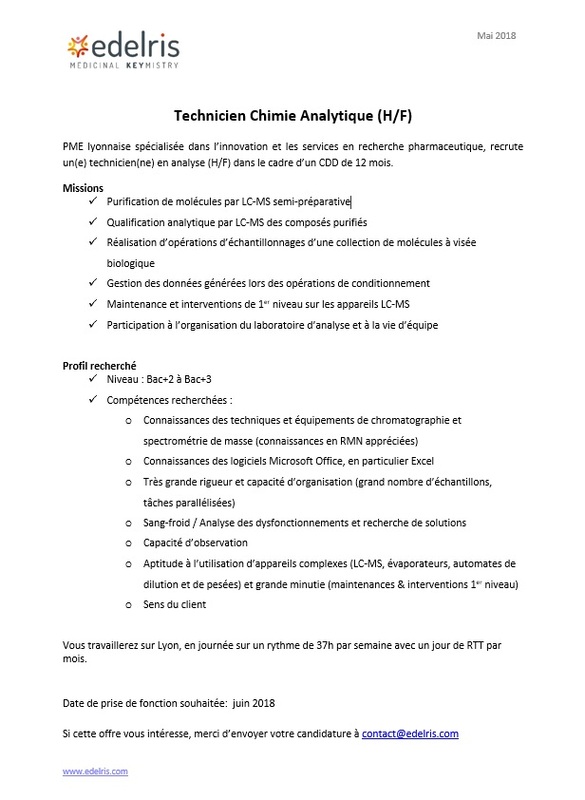 Au sein du service d’analyse et rattaché au responsable du service, le Responsable du Pôle Purification anime, en lien direct avec les équipes de chimie de synthèse, les projets de purification. Il réalise, avec son équipe, les purifications des bibliothèques de molécules et il contrôle la conformité des composés purifiés. Il est le garant de la bonne marche des équipements liés à la purification. We are a leading Drug Discovery CRO for Life Sciences organizations, providing expert Organic, High-Throughput, Medicinal and Analytical Chemistry services to the Pharmaceutical, Cosmetic, Crop Protection and Biotech markets. We are a leading Drug Discovery CRO for Life Sciences organizations, providing expert Organic, High-Throughput, Medicinal and Analytical Chemistry services to the Pharmaceutical, Cosmetic, Crop Protection and Biotech markets. Due to a sustained growth of our business, we are opening new positions in our organization. 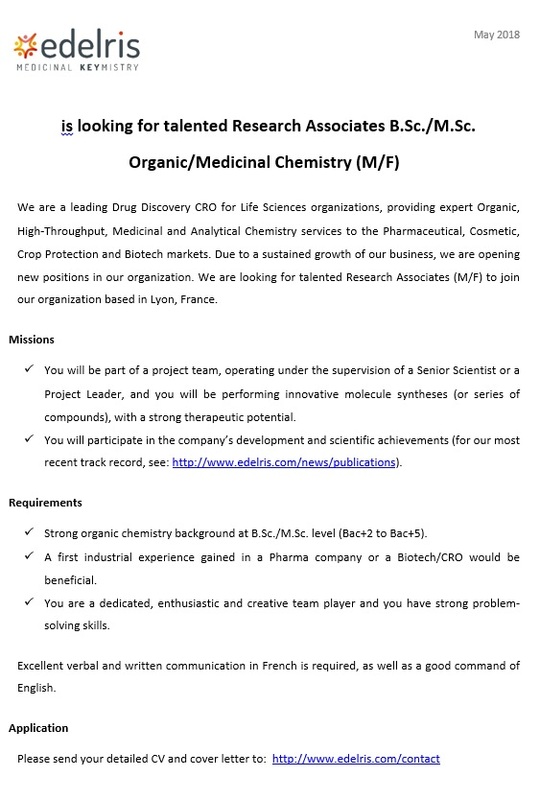 We are looking for talented Research Associates (M/F) to join our organization based in Lyon, France. We showcased the strategy put in place within Edelris to meet the target of delivering 40K innovative compounds to the ELF Public Compound Collection. By using the Lean Six Sigma approach we were able to significantly adjust our production tool, enabling us to reallocate effort to solving other demanding problems such as scaffold validation and additional value adding tasks. Key Performance Indicators have been shared and discussed. EDELRIS had the opportunity in August 2017 to present the work carried out in collaboration with Merck. This collaboration is a perfect example of the relevance and complementarity of EDELRIS’ Services. Edelris will give a presentation on "Mining from NP-Like Fragments in 3D: Discovery of a Potent Caspase-1 Inhibitor"
Our partner Bayer HealthCare presented interesting results from a collaboration with EDELRIS at the Annual Meeting AARC in Washington. This study case concerns a service of hit to lead on an epigenetic regulator: ATAD2. The work carried out by EDELRIS EDELRIS improved the affinity, selectivity and diffusion in tissues from Hits initially identified from a DNA-encoded compound libraries. Research Collaboration Agreement signed with Pfizer Inc.
Cycloaddition reactions are highly useful tools to address 3D-rich and functionalized scaffolds. This presentation will show the successful applications of [5+2]-cycloaddition reactions to access library scaffolds containing seven-membered rings. The chemistries were validated by the University of Leeds scientists and after transfer of knowledge to our scientists at EDELRIS, up-scaling and final library syntheses were effectively performed. Hurdles, solutions and outcomes will be discussed. On the occasion of the 5th International Symposium on DNA-encoded chemical libraries (Zürich, August 26, 2016), Bayer AG discloses a poster co-authored by X-Chem and Edelris, and describing the discovery of BAY-850, a selective ATAD2 small molecule inhibitor, underscoring the value of DNA-encoded chemical libraries to address difficult-to-drug targets (soon to be published). The [3+2]-cycloaddition reaction is a powerful tool to address 3D-rich and highly functionalized scaffolds for chemical library development. Applying this methodology, two diverse pyrrolidine containing scaffolds were designed. The in situ generated nitrone was reacted with N-Boc 2,5-dihydro-1H-pyrrole and its analog. The obtained isoxazolidine cycloaddition adducts were reduced and functionalized, leading to multiple entry points for diversity generation. Two 500-compound libraries were synthesized, validating the concept. There is a strong interest for the discovery of novel inhibitors of Caspase-1 (ICE), a protein involved in various inflammatory diseases such as rheumatoid arthritis, osteoarthritis or psoriasis. In order to develop new inhibitors, we used our EDEN platform (Edelris Discovery ENgine) to successfully explore the possibility to rescaffold competitor's ligands from innovative, 3D-enriched Keymical FragmentsTM.